My name is Greg Oly Plymouth PD Minnesota retired. I am riding my bicycle 250 miles to Washington DC and will riding with a band of honor on my wrist with Michael's name on it. I have raised money for Law Enforcement United to support the families of fallen officers. I ran a hero's 5k today in your honor Sir. You are not forgotten. Today I ran a hero's 5k in your honor Sir. YOU are not forgotten. As a Cowgirl I feel an extreme kinship with those LEO's who are a member of a Department's Mounted Unit. Back in August, 2004 I had the same accident with my horse. Massive head injuries, paralyzed from the shoulders down, and had a near death experience. 4 hours later I walked out of UMC, Las Vegas, Trauma Unit with 100 stitches in the back of my scalp, and a mild headache. I received a miracle that day, but I want to tell both families of Blood and Blue, life and death sit one on top of each other. It's instantaneous, and there is no pain. You stand immediately before our Heavenly Father who welcomes us home, or like myself, allowed me, through His Grace and Mercy to return. I have often wondered why He granted me the opportunity to return. After all these years I now understand why. It was to give the families comfort to know he didn't suffer, and he was welcomed home. He is the first person since 2004 that had the identical horse accident as I did, and I am a retired Aux LEO here in Michigan. Be comforted. Because of his love of horses I believe he has stood and watched herds of horses that have crossed over the Rainbow Bridge like my Danny, a retired Police Horse, run past him in beauty and freedom. Manes and tails caught by the wind, and blowing in the wind of running. Be comforted. God is with you. He knows your pain. Much love, Nancy, just a humble Cowgirl. God's peace and speed Deputy Winter. Thank you for your brave, dedicated service. RIP Brother. Give the family and friends the strength and faith to deal with this tragic loss. Words can not express my sorrow! Rest in Peace, Deputy Sheriff Michael Winter. Thank you for your service to this country and your community. My thoughts and prayers are with your family and your department at this time. On behalf of the Westerville, Ohio Division of Police, our thoughts and prayers are with the immediate family of Deputy Sheriff Michael Winters and the extended law enforcement family of the of the Branch County (Michigan) Sheriff's Office. End of Watch: Wednesday, May 31, 2016. To the family of Deputy Sheriff Michael Winter, friends, Sheriff C. John Pollack and the Branch County Sheriff's Office. RIP Brother.Thank you & God Bless. God bless you my brother. Thank you for your service and sacrifice. May His healing hand touch your family, friends, and fellow deputies. Rest easy my brother, we'll take the watch from here. You've finished your leg of the race. Now it's time to pass the baton. Rest easy. I am so sorry to hear of Michael's passing. My Condolences to his Family, Friends, Department, Community, & Country. Thank you Michael for your unselfish service. RIP Michael, Son of Valor, with Honor. Ms. Karen Morgan, PSY. LE. GRAD. With saddened hearts. 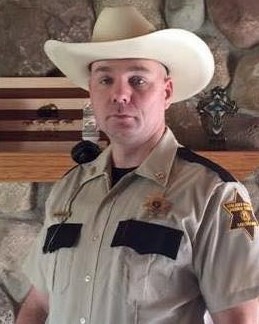 Deputy Sheriff Micheal Arthur Winter has gone 10-42...... Thank you for for your services will be missed but not forgotten. Sending thanks, respect and prayers for strength. Rest in peace, Deputy Winter. You deserve your divine reward.